Bottom Line - Get in, graduate and go far. Success depends on you. The 2018 Annual Report is Available! More scientific evidence of Bottom Line's impact! 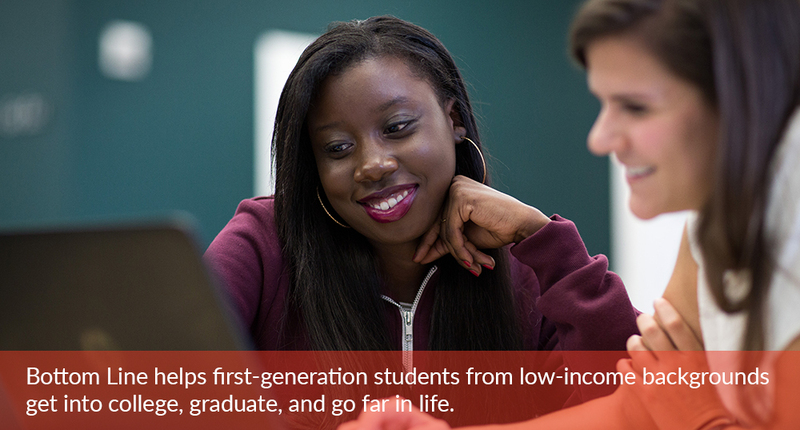 Three years into our 7+ year independent rigorous evaluation, our program model is demonstrating significant impact on college enrollment and persistence. Read the October 2017 Summary Report! ECMC Foundation is a philanthropic organization working to improve educational opportunities for all students – because, like Bottom Line, they believe education is the great equalizer. This video shows how their investment in our students allows us to continue supporting students as they get into college, graduate, and go far in life.